It’s not you, it’s me: Why did India refuse Pakistan and UAE’s aid? By Abhinav Pandya Published: August 28, 2018 0 SHARES Share Tweet Email There was no formal offer of aid through the official channels of the UAE – it was merely a verbal gesture. 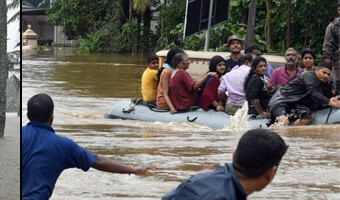 The Indian state of Kerala, known as God’s own country, has become the victim of nature’s wrath and is experiencing the worst floods of the century. Thus far, the floods have left 445 people dead and dozens missing. In the hilly regions, floods have caused landslides which have exacerbated the destruction of homes, bridges and road networks. Around 1/6th of the population of the state has been directly affected, and the central government has declared it a level-3 calamity, which clearly indicates the severity of the catastrophe. First of all, it is worth exploring why God’s own country has come under God’s ‘wrath’. For all the farrago of superstitious explanations coming from various quarters, it needs to be cleared that the floods can be … [Read more...] about It’s not you, it’s me: Why did India refuse Pakistan and UAE’s aid?